I was looking for some files on my computer, and I stumbled on all the pictures I took of the house during the inspection. Apparently I had placed them in a separate folder than the rest of my pictures, so I only had the few I’d uploaded to Flickr. 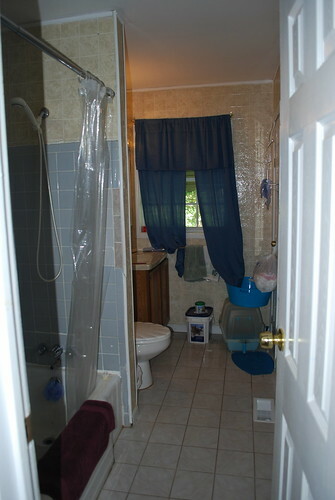 I found several “before” shots of the bathroom before we took down the doors. This more than anything gives a clear picture of how disgusting this house was when we bought it. 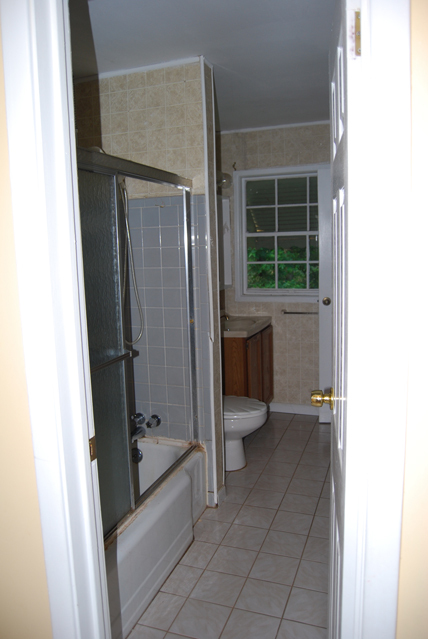 The bathroom at first glance – the doors were one of the very first things we did when we started our renovations. Our beautiful wall of mirrors. Also notice the very rusty vent cover on the floor – we replaced that fairly quickly as well. Most of the changes we made to the bathroom have been very minor, but we have grand plans for the future. You can see the current pictures of the bathroom here and I am working on updating all the before and after pages for each room. I have been working on turning the before/after pictures into separate pages (instead of linking to past posts), and I noticed that even though we haven’t done any major updates to our full bathroom, it still has changed a little bit since I put the original pictures here. I decided it was time for an update! We also made a couple of small changes this weekend. 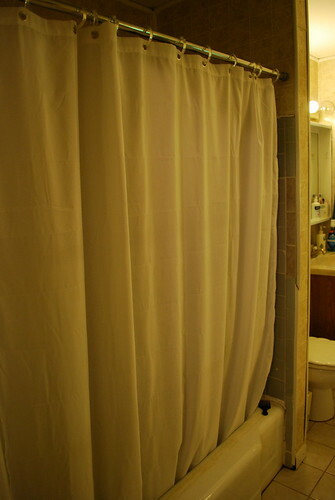 Our shower curtain bit the dust, so I bought a fabric shower curtain liner to replace it. 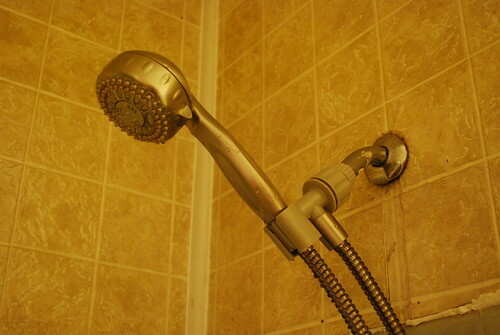 We also were having some issues with our showerhead so we replaced it with a new one. Comparing to the last picture, you can see that we no longer have a litter box and I also fixed the curtains. I simply cut off the valence and hemmed the bottom so the curtains sat slightly below the sill. You can see the curtains a little better in this picture (and compare to before). There are awnings outside over a few of the windows, which we’ll probably remove whenever we redo the windows – you can see the awning, though when you’re standing right there and look out you mostly just see the backyard (since you’re most likely looking down and not straight out). We also had to replace some of the lightbulbs, which did brighten the bathroom a little bit (than the previous one bulb). We look forward to someday replacing the whole unit to something prettier! Previously, we had a clear shower curtain liner. The shower curtain we got for our wedding is very thick and I was concerned it would make the shower area too dark. However, that clear liner was starting to wear out, so I bought a white fabric liner. So far, I’m a big fan! I was worried it would be too dark, but it let in a surprising amount of light. Also, it made the shower seem cozy like a well-lit cave. I’m a big fan of our new shower head! I’ve only taken one shower with it, but already I’ve noticed a huge difference in pressure. I spend a lot of time daydreaming about what I want to do with our house if I had unlimited funds. It gets me through the dry spell where we can’t really spend a lot of money redoing anything until we get our foundation fixed. After the foundation, we’ll probably tackle the bathroom next since it will hopefully be a cheaper task than the kitchen. They say bathrooms and kitchens are very important when it comes to selling your house, which is why we’re putting them at a higher priority than other things. This might all change once we actually get there… I figure we’re still at LEAST 12-18 months away from the foundation (maybe longer), and then more time after that to save more money. In the meantime, I’m daydreaming about what I want to do in the bathroom. I figure this is good for two reasons. One, it helps me get an idea of what I really want in there, and it will help us estimate our budget for the reno. As a bonus, it’s getting me through the boring stuff like foundation repairs! 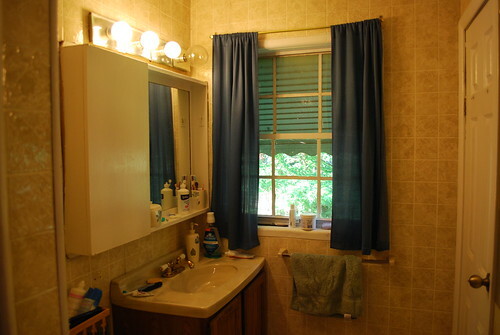 If you can’t remember what our bathroom looks like, you can get a quick refresher here. First of all, we plan to take down all the weird faux tile on the wall and the mirrors. We’re not sure what’s behind them, so we’ll be prepared to perhaps install drywall if needed. 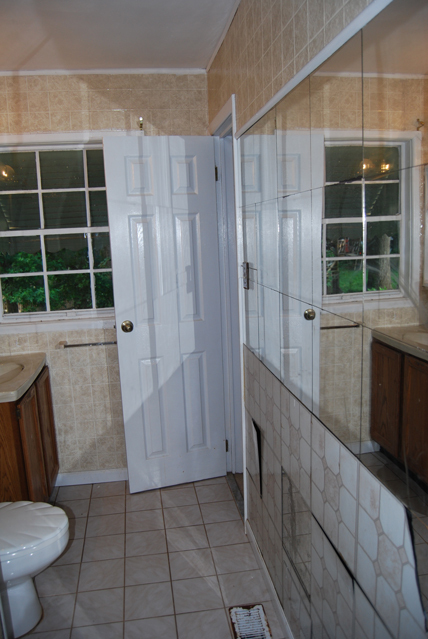 We also want to close off the door that goes from the master bedroom into the bathroom. We never use the door and if you’re in the master bedroom, you can hear EVERYTHING going on in the bathroom (which is not very private in my opinion). Also, there is valuable space in front of the door in both rooms that can be used for something else. Hopefully it won’t be a problem to cover the doorway with drywall… We’ll have to consult some professionals when the time comes. I hope to paint the walls something like a sage green or a grayish blue… It’s hard to describe what I have in my head, but most likely paint color will be chosen after everything else. I’d have to see it in person to know if the colors match well enough. Perhaps putting it where the door currently is? I’d have to measure the space. We do have a linen closet, but it is in the hall outside of the bathroom. I’d love something in the bathroom as well, if it doesn’t make things too crowded. 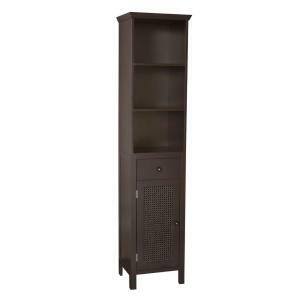 Another option is built-in shelves, which is another possibility. I definitely want to have plenty of towel rods (we don’t have any for bath towels currently). Three other things we want to do to the bathroom: first, we need more lighting (it is very dark in the shower area), so we thought two recessed lights above the shower would be awesome. Also, we need a bathroom fan to help prevent mold growth. The attic is right above the bathroom so hopefully neither of those two things will be complicated. Another thing which I’m VERY excited about is putting an outlet in the bathroom – probably by the sink. I don’t blow dry my hair or use a curling iron or anything, but I really miss having a way to put a night light in the bathroom. So what do you think of our plans? 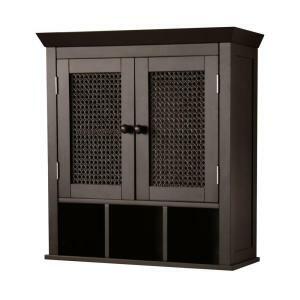 They might change in the next 2 years… I may end up with a completely different color for the vanity and the hardware style/color… Or this may be just a first step. I’d love your feedback. This is our only full bath. 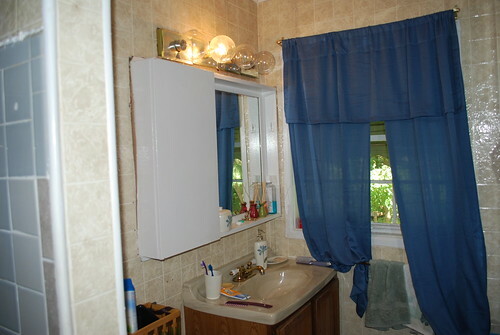 It has a door off the hallway as well as a door off the master bedroom (it’s on the right across from the sink – you can see the doorknob if you look closely at the picture). We don’t use the door off our room at all – it’s blocked on both sides by things. Actually, I’d love to completely remove that door, and turn it back into a part of the wall. Does anyone have thoughts on how that would affect resale value? My biggest complaint about the door is that when you’re in the bedroom, you can hear EVERYTHING going on in the bathroom. When it’s your husband, not a big deal. But when it’s a guest… I just think bathrooms deserve to be private places! Anyways, again, all this is far down on the list, so I’m not making plans yet. Just dreaming. Our bathtub. 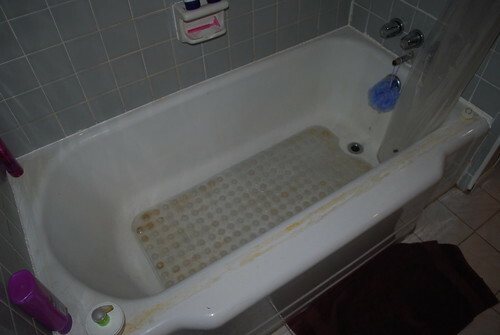 There used to be shower doors on here, and I’m afraid that no amount of elbow grease, cleaning agents, and scrubbers could get rid of the lines on the tub from the doors. Also, the rust in the water leaves its mark on the shower mat – I do clean that thing fairly frequently, but it gets gross quickly. Some of the tiles were broken, and we were unable to find matching tile to replace them. I think the lighter blue color was a pretty close match, but there were no long-and-thin tiles in the same color. So we ended up with 3 different tiles. Also, apparently 50-year-old tile is slightly smaller than tile you can find today, so my dad had to trim the tile we bought. (The white circle on the top is from the shower door – we have 4 of those holes that we plugged up with caulk). The sink area. 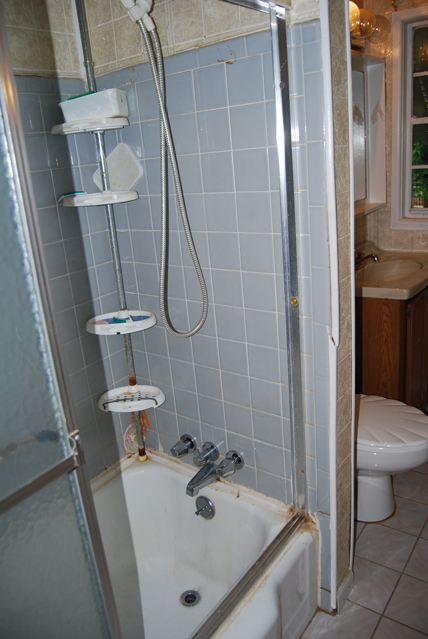 Not too bad, actually – I think the sink, toilet, and tile floor of the bathroom were replaced fairly recently. I actually really like the mirror with the ledge on the bottom – a great place to keep my contacts. 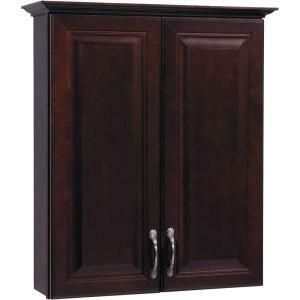 The medicine cabinet is hard to open – you have to open from the top. Wha-la, it’s baby proofed. The lights above the sink are UGLY in my opinion. Also, because only one is working, the bathroom is pretty dark. The window has an awning over it outside so not much light comes in. I need new curtains – just haven’t gotten around to getting them (and unsure of what I want). Another thing I hate is the faux tile they put on the walls – if you can’t tell, it’s just like plastic wallpaper. We had to tack it back up when we bought the house because it was falling down. 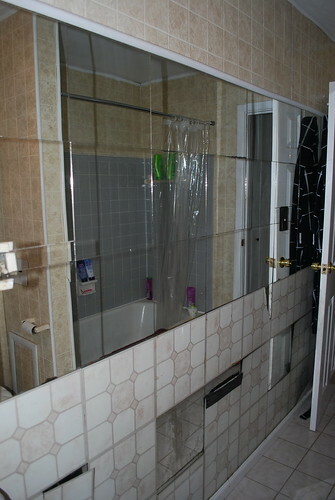 And the “best” part of the bathroom – our wall of mirrors. I’m not sure if this is 60’s decor or just someone’s bad taste. The pros: it makes the bathroom seem larger (it is rather long and thin, isn’t it? 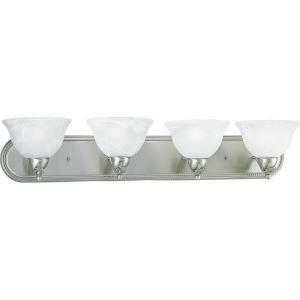 ), and also helps reflect light to the shower area. 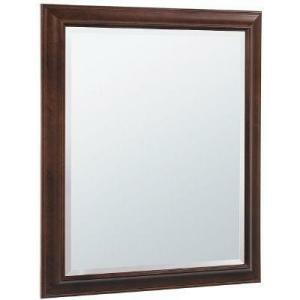 The negative: the bathroom is probably one of the few places I would want to have a reflection of myself wherever I go. Somebody else had the good idea to take those stickable vinyl floor tiles and put it on the bottom half. Unfortunately, some of the tiles are falling down. So here’s my dreaming ideas. 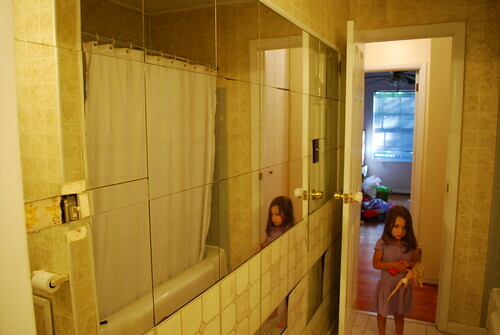 I want to take off the mirrors and take down the weird faux tile on the wall. I don’t know what’s underneath them, so we will need to wait until we can handle (financially) the possibility of having to put up drywall. I am not sure what color I want to paint the bathroom, but we’ll see what our house looks like whenever we get the money to do the bathroom. Whenever we get new windows, I hope to get frosted glass for the window. In the meantime, we could do one of those window stick-on things that could turn it into frosted glass. I’ve heard they work well. I’m not sure when we’ll do that, but it’s somewhere on my list. Frosted glass will allow more decor freedom when it comes to curtains. I’d like to get a fiberglass tub to replace the one we have. 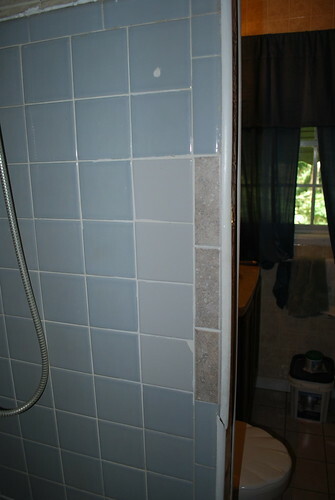 And we’ll have to do something about the tile – most likely rip out what’s there and either replace it with more tile or with a fiberglass shower unit thing (I can’t remember what they’re called). I think the sink is probably fine, but I’d like to get a new faucet – I love the look of brushed nickel, so perhaps we’ll do that. We’ll definitely need a new light fixture above the mirror, and I’d like to see about putting some recessed lighting above the shower to lighten that up a bit. (There is attic above the bathroom, so that makes it easier). 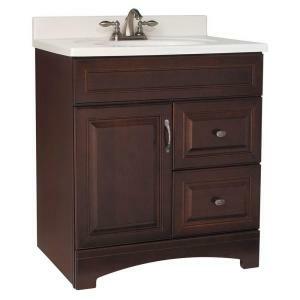 Another issue with the bathroom is the lack of towel rods anywhere, and no storage space. I’m not sure if there’s anything that can be done about the latter, but the former will probably be easy once we take out the wall of mirrors. I already mentioned maybe blocking off the doorway to the master bedroom, to gain some wall space for both rooms, and for sound blocking. And probably the biggest issue – there aren’t any outlets in the bathroom at all, and that is definitely something that will need to be changed. I don’t know how hard it would be to add some outlets, but hopefully we can at least get one by the sink without too much trouble. Like I said, the bathroom is pretty far down the list. 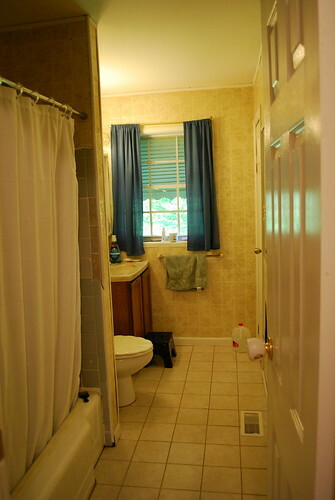 I’m hoping we can get to it before we would like to sell the house (not that we’re planning on selling anytime soon, but neither of us think it’s going to be a “forever” house), because I know bathrooms are really important for potential buyers, and this one is a doozy! Do you have any suggestions? What would you do?